Miss Fisher’s Murder Mysteries the first Australian drama to be adapted in China. Production has begun on a Mandarin language version by the Shanghai 99 Visual Company. 30 episodes will be produced for Tencent Network, to screen in the spring of 2020. The Chinese version will be set in 1930s Shanghai, starring Chinese actress Yili Ma as its glamorous lady detective. Jin Weiyi is the head writer and one of the producers. Fiona Eagger and Deb Cox, Every Cloud Productions founders and creators will serve as creative consultants to the Shanghai 99 Visual Company production. “It’s such a thrill to be on set in China for the first week of production and to see Miss Fisher incarnated in the fabulous setting of 1930s Shanghai. The cast and crew here are wonderful custodians of the Miss Fisher brand and we look forward to a continuing successful relationship with Shanghai 99,” Fiona Eagger and Deb Cox said. Miss Fisher’s Murder Mysteries, based on Kerry Greenwood’s books, has sold to an unprecedented 247 territories in 179 countries and has amassed a fan base in the millions worldwide. 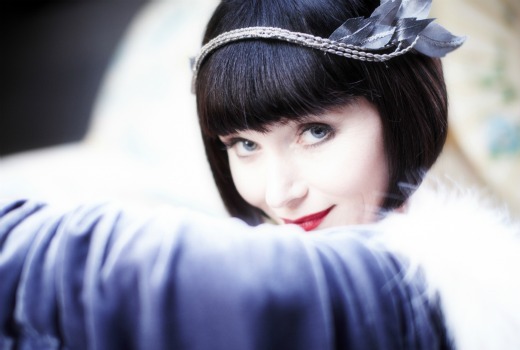 Feature film Miss Fisher and the Crypt of Tears, starring Essie Davis, will be released in Australia by Roadshow Films and in the US by Acorn. Seven spin-off Ms Fisher’s Modern Murder Mysteries will air on Acorn in the US and UKTV in the UK later this month. Has to be said that it’s not particularly an Australian format as such, owing much to the various British amateur sleuth series set in the interwar period-Shanghai is a good choice of location, but the politics of the period may be a problem for the Chinese govt censors. I read the headlune and thought ooh China, Shanghai in the 20s that would be cool. I’d love to see that. 30s. So not far off.